When Does Social ‘Aggregation’ Become ‘Stealing’? So, last week I accused Michael Gray of being off his crazy pills when he accused Google of stealing content and hijacking traffic by showing a business’ hour and review information in the SERPs. Michael and I don’t always agree but I typically ‘get’ where he’s coming from. However, this time I didn’t. It seemed like he was making a big deal out of nothing because, as Patrick Sexton so eloquently tweeted, businesses want customers, not Web visitors. If Google wants to improve user experience by displaying business information in the SERPs, that seemed okay. They weren’t stealing it; they were just being useful by aggregating it. But then something funny happened. And it was suddenly like I was chewing on the exact same crazy pills the doctor had prescribed Michael. It started with a WordPress plugin. I love Tamar Weinberg’s Techipedia blog. I may always misspell it (my brain is convinced it’s Technipedia), but she provides some of the Web’s best material on social media. I headed over there last week to link to one of her posts and noticed that she was using the BackType plugin for WordPress that allows you to pull content from sources who mentioned a certain URL. Because we linked to a post written by Tamar, she’s using the plugin to pull in ALL the comments that people left on our blog post that linked to her. So everything that OUR commentors said about OUR post now shows up in the comments of her post. As a blogger protective of her community, you can probably understand why I wanted to punch that plugin in the face. From the outside looking in, that plugin steals our comments, our commenters and moves our entire conversation to a foreign location. Dude! I discovered the plugin through Tamar but it’s obviously no fault of hers what it does. She’s just trying to guestimate relevant content to her community. And a quick search shows she’s certainly not the only person using it. I became obsessed with looking into this plugin and the effect that ‘aggregating content’ was having on our site and our community. We did a search for an exact comment left on an Outspoken post to see if Tamar’s blog post outranked us for our own content. We were happy to see that it didn’t, but we also know that we’re lucky in that regard. We have a strong link profile on Outspoken and we’re able to match up against the strong link profile held by Tamar. That made us keep digging. 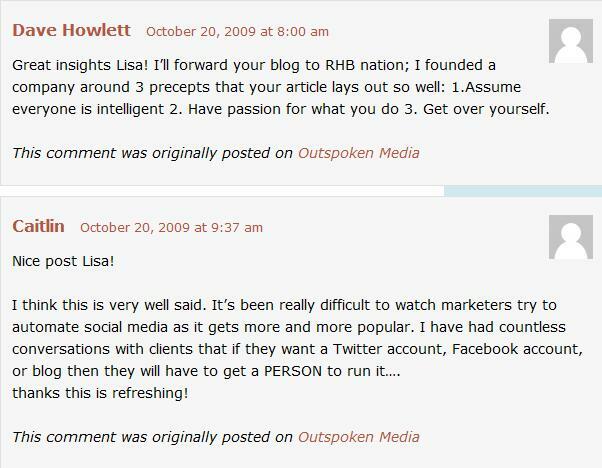 We went to another post of hers and took an exact comment that was taken from January’s roundup post on Matt McGee’s Small Business SEM blog. Anyone familiar with that blog knows it has a strong reputation for producing great content. However, even with that reputation and link profile, it’s still Tamar’s site that shows first for the search. That made me worry. Because if this can happen innocently with a blog as strong as Small Business SEM, then what does this potentially mean for smaller/niche bloggers without such high profiles and backlink equity? Or, if we’re getting mischievous, what if someone wanted to purposely hijack your community and commenters? It felt as if this plugin was giving them a way to do that. Potential for duplicate content issues aside, what about the effect aggregation is having on user experience? Thanks to this post, we’ve now linked to three of Tamar’s posts in a context that has nothing to do with the thoughts and theme of her original post. That means that every comment now left on this post will be aggregated into the actually-relevant comments on her post. What happens when irrelevant comments start to overpower (or at least outnumber) the relevant comments? Her audience is probably going to get confused. Even though the plugin is obviously meant to increase user experience, I question whether or not it actually does. The plugin does a good job identifying what blog the aggregated comments come from, however, since when do people read on the Internet? They don’t. What if people miss the credit link and don’t realize the comments are from our community, not Tamar’s? They may ask a direct question or make a direct comment to one of the Outspoken commenters and find themselves frustrated when there isn’t a response. Then they start questioning the friendliness and helpfulness of one or both communities. That’s not good. It’s all left me wondering something. With Google aggregating business information and displaying it in the search results and with plugins aggregating tweets and comments from one community and displaying them on another… where’s the line between aggregation and content theft? I was quick to dismiss Michael’s claim that Google was stealing content because I thought it provided value. Does that matter? Do we measure degree of value? Is everything on the Web simply fair game? Home › Internet Marketing Blog › Social Media › When Does Social ‘Aggregation’ Become ‘Stealing’?